Mercedes’ smallest car packs in luxury features once unheard of in its size class. Imbuing even the most proletariat items with some form of luxury is probably more emblematic of modern life than avocado toast and $8 coffees. Case in point: McDonald’s Angus beef burgers. Yes, while you could debate the provenance of said Angus beef, or if they’re even using the nameable, mentionable parts of the cow is a moot point. Or, for that matter, whether it was necessary to axe the Quarter Pounder, pound-for-pound (heh) the best fast food burger on the planet, even better than the absolute horror show that the Big Mac is these days. Anyway, the point is, it’s still a premium beef burger from the world’s most powerful fast food chain. Interestingly, carmakers have gone the other way—making ever-smaller, more affordable cars in order to appeal to the younger set. The Mercedes-Benz A-Class, for example, which made its debut in 1997. Of course, building a premium product to a cost comes with its own pitfalls. 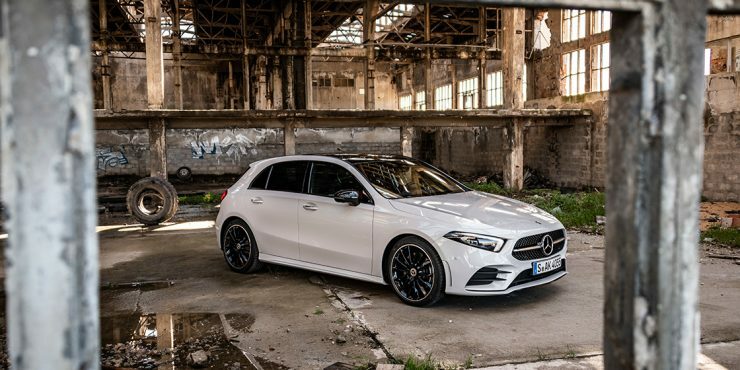 The most premium thing about the first-generation A-Class from two decades ago was the three-pointed star adorning its grille, bootlid and steering wheel. The less said about its dismal plastic interior, the better. Zip forward three model generations and if we were to blindfold you before getting into the new A-Class, you’d hardly think you were in the ‘Baby Benz’. The first thing that greets you is the garish magenta of the LED interior ambient lighting strips adorning the doors, dashboard, centre tunnel and bezels of the air-conditioning vents. Now, magenta might not be everyone’s shade, so Mercedes-Benz helpfully allows you to select 63 other colours. Ombre, colour-cycling and syncing it to the climate control (turns red when you turn up the temperature, blue when you turn it down) is also on offer. The extent and customisability of the interior lighting isn’t exactly news, but the fact that it’s offered on the three-pointed star’s entry-level model, however, is. The same goes for the A-Class’ dashboard. 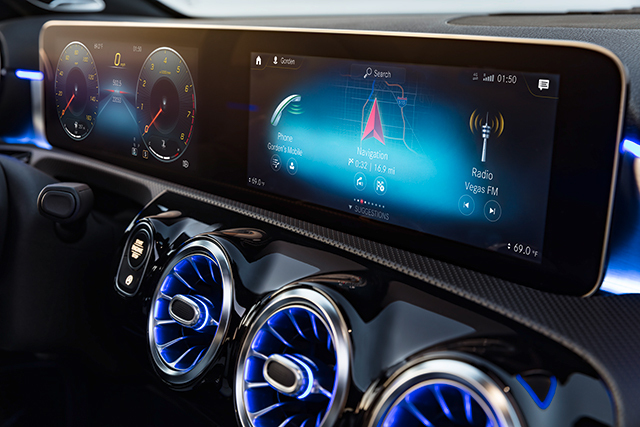 Staying on the topic of upmarket features, the A-Class shares its dual 10.25-inch displays—the infotainment screen and instrument cluster—on an uninterrupted, freestanding, dashboard-spanning glass panel with models as far up the Mercedes-Benz model tree as the S-Class. Well, not entirely like the S-Class, because the little Merc is the beneficiary of a new infotainment system, dubbed MBUX (Mercedes-Benz User eXperience), replacing the COMAND system of old. It also ditches the clunky rotary controller/touchpad combo and relies on a touchscreen/touchpad input scheme instead. While the displays themselves are deliciously vivid and the system’s operation crisp like the very latest phones, it’s still a tangle of nested menus, plus how a touchpad still isn’t the best way to negotiate menus. So, in some ways the A-Class has a leg up on the S-Class, but there are still a few elements that betray the former’s more budget leanings. The window winder switches are plastic, as are the endcap pushpieces of the wiper stalk and gearlever stalk. And its drivetrain isn’t perhaps the most refined thing out there. Its seven-speed dual-clutch transmission is jerky at low speeds and is oddly ponderous when left to its own devices. As for its engine, an all-new 1.3-litre turbocharged unit, has an agricultural, lawnmower-y rasp at low to middling speeds. A far cry from the turbine-like butteriness of the nine-speed automatics and six-cylinder motors equipped on the A-Class’ bigger brothers. Thankfully, and paradoxically enough, all those problems go away once you start driving the doors off the thing. The agricultural rasp turns into a pleasant baritone burble and the gearbox displays some impressive deftness. The 163hp its engine produces, and its 8 seconds 0-100km/h time doesn’t sound all too impressive, but to its credit, the A200 feels a lot zippier than it does on paper. The surge you get when the turbo comes on song also provides for a bit of engagement, and it’s a refreshing change from the staid linearity of many modern turbocharged engines. 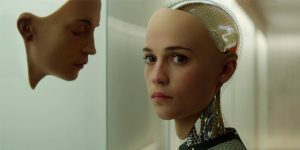 Good thing, then, that its chassis can keep up. 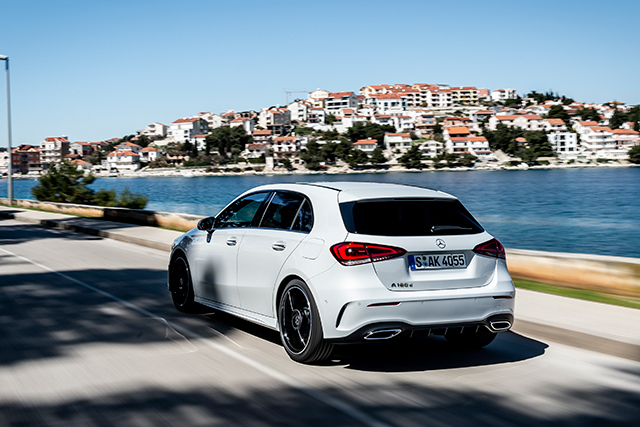 In more improvements over its predecessor, the A-Class used to have (in non-AMG form, at least) a choppy ride and squirmed uncomfortably when pushed hard. The new car largely solves those issues, though the going can get harsh at times and if you really do decide to throw caution to the wind, its tyres make it clear that’s something it’d rather not be doing. The new car, even in supposedly sporty AMG Line trim (commanding a $5,000 premium over the Progressive trim level), comes with all the requisite racy trimmings, including lowered suspension, bodykit and two-tone leather interior, but comes shod with comfort-biased Bridgestone Turanza rubber. A head-scratching choice, to be sure. But small missteps aside, the A-Class is, as far as we’re concerned, the most impressive competitor in its class. Equipment levels equivalent to cars a class (or two up), thoroughly thrash-able chassis and decent practicality. 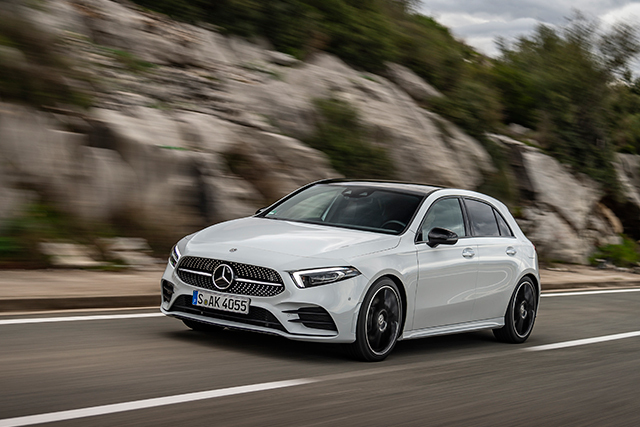 The only sticking point comes in its price tag.The A200 in AMG Line trim we tested costs $157,888, which is over $20,000 more than a comparable Audi A3 Sportback. In all fairness, the Audi is due to be replaced in the next year or so, and in its current form, you won’t get anywhere near the levels of kit the A-Class has. To resuse our hamburger analogy from earlier, the new A-Class would be a gourmet one with the works. Wagyu patties, handmade brioche bun, artisanal cheese, organic greens, you name it. An expensive take on something workmanlike, yes. But is it worth it? Well, that depends on how you want to look at it. But heck, nobody ever said the better things in life came cheap.